Read on for the whole list of known stuff. Good all around. Any idea when we’ll be getting that Sephiroth skin? Nothing confirmed yet, but don’t worry we still have this in our plans… Whatever happened to the Marvel Comics themed costume pack that was supposed to come out a year or so ago? I REALLY wanted a Wolverine Sackboy and it’s quite disheartening that something so cool was announced and shown and then never mentioned again. We announced the partnership at Comic-Con last year (but no release date). It takes a bit of production time to get everything lined up, but hopefully you’ll hear some announcements soon. 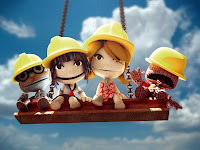 Will LBP2 include from launch day all the DLC of LBP1? Including costumes level packs and all that good stuff? Because of the backwards compatibility for LBP1 DLC, all the costumes on the PlayStation Store will still be available for purchase. Expect to see a ton more content in the next few months, including the eventual LittleBigPlanet 2 DLC. Sackboy, no matter what costumes he wears still looks like Sackboy in LBP1, seeing the new costumes in LBP2 has this idea been lost? Some of the new costumes we’ve shown for LittleBigPlanet 2 are certainly unconventional, but then Sackboy has an eclectic wardrobe taste. At the end of the day however, he’s still Sackboy and we’ll be sticking close to making him look that way no matter what the costume. Will Stephen Fry be narrating it again? 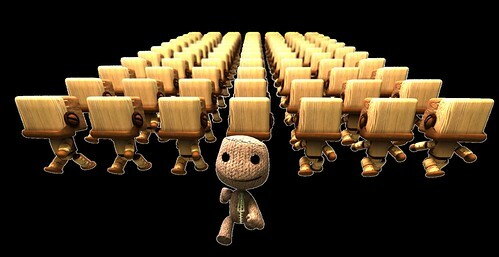 Yes, your (and our) favorite narrator will be back for LittleBigPlanet 2. Will this game have the 50 levels single player like the first game or is this just a big create kit? LittleBigPlanet 2 is a whole new game, so just like the original you get a full storyline for Sackboy to play thru. Add to that the endless possibilities of the evolved Create and Share modes, where you’ll see completely different gameplay experiences in the community levels.